Ujian Nasional Sebentar lagi. Hayoo udah siap semua belum sobat?? Insyallah ujian nasional untuk tinggkat SMP/MTs akan dilaksanakan pada tanggal 5-8 Mei, bentar lagi ya. Persiapkan semuanya matang-matang ya sobat. Jangan lupa juga berdoa. Kementrian pendidikan sudah menyepakati bawah ujian nasional tahun ini menerapkan standar 60/40. Lulus atau tidaknya siswa bergantung pada nilai akhir dari 60% nilai ujian nasional dan 40% nilai sekolah. Nah untuk membantu sobat-sobat yang sedang mempersiapkan ujian nasional yang akan datang, Zona Siswa kembali menghadirkan Latihan UN SMP Bahasa Inggris Part 3 yang diambil dari ujian nasional tahun 2013. Semoga bermanfaat. Check this out!!! 1. What does the caution above mean? A. We must be careful because harmful algae grow in this water. B. Swimming in this water may harm the algae that grow in it. 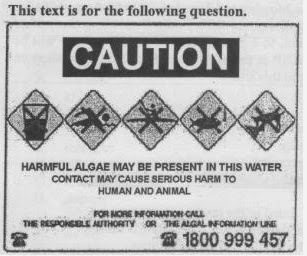 C. The algae cannot cause serious harm to the animals. D. Harmful algae does not grow well in this water. A. The condition of all new students. B. The program of nursing faculty. C. The activities of admission program. D. The change of new admission. 5. Which of the following information is found in the text? A. The stadium to hold all the activities is behind Undip gas station. B. The first day activities will be held in PSIK FK building. C. The second day of the activities will be held on August 23rd, 2013. D. The activities are announced after they know about Nursing Faculty. 7. 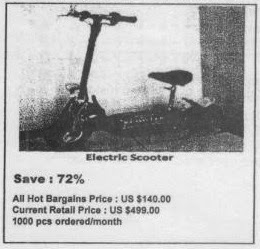 How much is the retail price of the Electric Scooter? 8. From the text above, we know that? A. There are 140 orders for electric scooter every month. B. The advertisement offers 72% discount for the product. C. The current retail price for public is 140 dollar/pcs. D. The minimum order for electir scooter is 1000 items. 9. Which train travels the earliest from Semarang? 11. What does the text tell you? A. Traditional cuisines of Solo. D. Fun holiday in Solo. 12. Where did Lia go on Wednesday? 14. 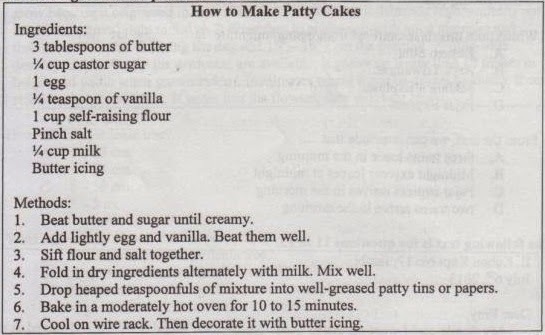 What is the last step you should do in making the cake? A. Bake in a moderately hot oven for 10 to 15 minutes. B. Ice with butter icing wen the cakes are cool. C. Beat butter and sugar to cream. D. Sift flour and salt together. 15. How much sugar do we need to make Patty cakes? 20. What is the main idea of the second paragraph? A. Phuket covers land and many sandy beaches. B. Phuket has spectacular natural view. C. Beautiful beach film had been displayed in Phuket. D. Dozens of smaller islands can be reached by the boats. 21. "A rich culture, a beautiful coastline, ...." (paragraph 2) What is the synonym of the underlined word? 22. The text above tells us about ... Transjakarta. 23. where can we donwload the map of Transjakarta? 24. Why does of Transjakarta's station become a problem? A. It is made of steel and glass. B. It has no ventilation at all. C. It does not have good roofs. D. It is in the shape of an enclosure. 25. What does the second paragraph tell us? A. The situation when the bus stops at the station. C. The way passengers of the bus leave the station. D. Many people like to get on and off the bus. 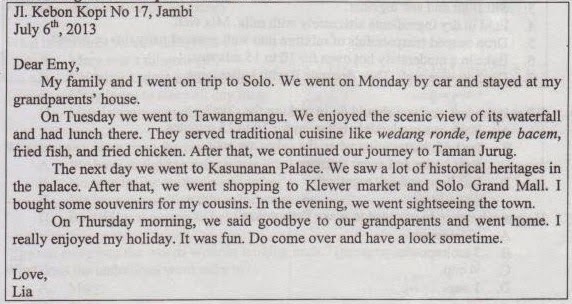 Semoga artikel tersebut di atas tentang Latihan UN SMP Bahasa Inggris 3 bisa bermanfaat bagi sobat semua. Apabila terdapat kesalahan baik dari segi penulisan maupun jawaban, mohon kiranya kritik dan saran yang membangun dari sobat semua. Terima kasih.